In my last post Traditional And Conventional Growing I wrote a little about growing in sustainable ways and The Great Dust Bowl of the 1930’s. 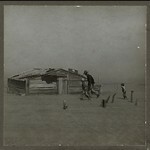 I want to write about what happened to the farms and ranches on the great plains states of Texas, Oklahoma, Kansas and New Mexico in the 1930’s and how that disaster pertains to what we do in the garden and on the farm today, and the most important practices we can put into use to avoid another dust bowl disaster. When European settlers first arrived the Great Plains were the range of the bison and of the Great Plains culture of the Native American tribes of the Blackfeet, Crow, Sioux, Cheyenne, Arapaho, Comanche, Arikara, Mandan, Pawnee and Wichita. The deep roots of Prairie Grasses on which bison grazed held the soil on the Great Plains where some of the harshest weather in our country was common. Several actions in the 1920s increased the region’s vulnerability to drought. Low crop prices and high machinery costs meant that farmers needed to cultivate more land to produce enough to meet their required payments. Since most of the best farming areas were already being used, poorer farmlands were increasingly used. Farming submarginal lands often had negative results, such as soil erosion and nutrient leaching. By using these areas, farmers were increasing the likelihood of crop failures, which increased their vulnerability to drought. Farmers plowed the land to grow wheat season after season without rest. Ranchers grazed their cattle until the prairie grass was gone. A bumper crop of wheat in 1931 caused prices to fall. Many farmers didn’t make enough to keep their land, and plowed abandoned land was left unplanted. Other farmers remained through the drought farming what they could. Drought continued, and then windstorms, and blowing snow storms. Dust was everywhere. People and cattle died sickened and suffocated from the dust. 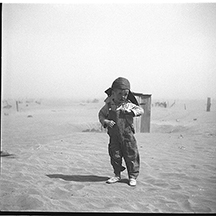 People as far east as Washington DC saw dust that had blown from Texas, Oklahoma, S.W. Kansas, and N.E. New Mexico. Dust storms shifted soil, or what had been soil from farm to farm on the plains. 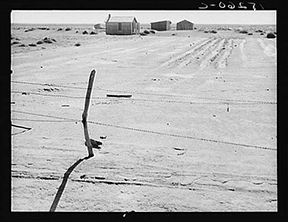 By 1936 90% of farmers in the dust bowl were receiving aid from the government. When the drought finally ended nearly a decade after it began farmers changed the way they operated their farms on the plains adopting irrigation practices. We know now that just irrigation is not enough. Today if you look at land that has been plowed and planted year after year you may notice that it is lower than the unplanted land surrounding it. It took ages for soil to cover the surface of our earth. In less than 100 years we have greatly diminished and depleted our best soils. Plowing the soil breaks the structure of soil, causes run off and erosion stripping our land of its precious soil. You can even see the soil taking to the wind as the plow runs through the field. Sustainable No Till farmers have retired their plows, nearly never plowing farm land and pasture. Wise farmers now rotate crops allowing fallow lands to grow pastures of green mulches. A year ago I couldn’t have imagined a farm working without a plow. Farmers are changing, and I am changing too. This season I wrote about the first time I planted seeds into heavily mulched soil without turning it first in Soil Tilth And The No Till Garden . If you are not raising or “uppening” the land every year then it is being depleted. Every season we should be adding organic material to our soil, mulching ornamentals heavily with chopped up yard wastes, mulching vegetable beds with brown leaves, pet cage bedding, newspaper, or straw. Whatever waste we generate that will break down should go back into our yards and gardens. This is what is called uppening the soil. It is good for your yard, good for our gardens, and will lighten the load on our landfills. Go ahead and put the mulch down, and plant right into it. Don’t turn it, don’t till it. Give the soil a break, and don’t break your back! You can’t cheat mother nature. It catches up with you. It is strange that the consequences of such prolificosity(if that is a word) did not raise a flag. We learn the hard way. Thanks for your comment Danny. I don’t think being prolific or productive growers, and being stewards of the land are mutually exclusive, but being productive won’t pay off for long if we don’t renew and protect our resources.